Archived article. This article was last updated June 26, 2018. The call for comments is no longer current. In 2016, Congress passed a bill to establish a national system of mandatory GMO labeling and gave USDA two years to develop rules for how products will be labeled. USDA recently released its proposed rules and is asking for public input before July 3, 2018. This will likely be the final opportunity for public comment on rules associated with this law. Hear Colin from Environmental Working Group explain how these regulations came to be, and how they could impact you. For nearly a decade, food co-ops across the United States have advocated for national, mandatory GMO labeling. We have called for a clear, simple label that can tell people at a glance if a product contains GMOs or was produced using genetic engineering. We believe that people have a right to know what is in their food and we think that USDA’s proposed rules fall short of this level of transparency and accessibility. These are the most common, well-established labeling terms, already in use by many companies and recognizable to the general public. 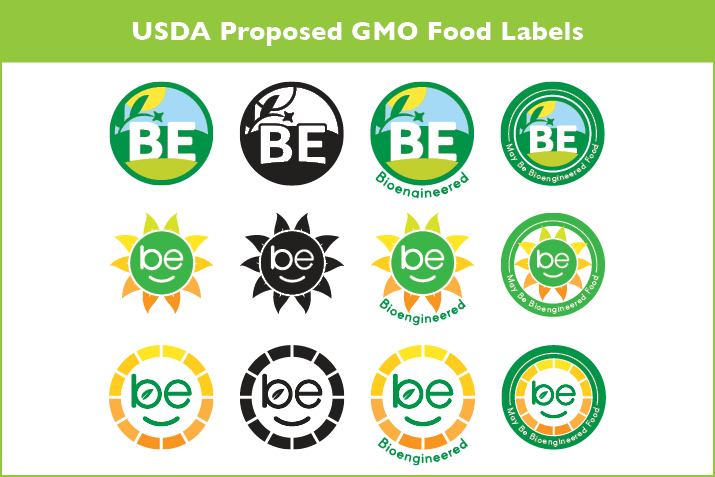 USDA’s proposed labels would use the term bioengineered instead, which is less familiar. The law requires USDA to use a neutral symbol to indicate that a food is produced with genetic engineering, we don’t think the proposed symbols are sufficiently neutral. QR codes allow food companies to avoid saying in plain words that their product contains GMO ingredients. QR codes require shoppers to have a smartphone and internet service, which means GMO information would be inaccessible for the nearly one-in-four Americans who do not own a smartphone or the estimated 20 million people who live in rural areas without reliable cell service. As proposed, USDA’s regulations would leave out about 70 percent of all foods produced with genetic engineering. That’s because many foods contain highly refined sugars and oils that, although they were derived from GMO crops, do not contain enough DNA to be detectable using current GMO testing methods. If you would like to make your voice heard on this issue, you can submit formal comments on the Regulations.gov website. Remember to include this code at the top of your comments: #AMS-TM-17-0050. Learn more Tips for Submitting Effective Comments. If you only have a minute to spare, you can visit the Just Label It website and sign this petition to USDA calling for consumer-friendly GMO labeling regulations.